ST. PETERSBURG — Plans for a 25-story condo tower in downtown St. Petersburg caused considerable excitement when they were revealed in early August. To be built on Second Street, N, the 100-unit tower would be catty-corner to the Sundial shopping and entertainment center. There is just one problem. The Tampa company that owns part of the land where the tower would go says it knew nothing about it and doesn’t want it. "We found out about it when we read it in the paper," said George Glover, chairman and CEO of the BayStar Hotel Group. The company filed an objection to the tower on Aug. 10, the deadline for an appeal, and that stopped it — at least temporarily. An application for "streamlined site plan approval" of the $40 million project, which would have allowed it to proceed without a public hearing, was submitted in July by Loan Ranger Acquisitions and Ping Pong Partners. Loan Ranger is connected to Sundial developer Bill Edwards. Ping Pong Partners was formed by Steve Gianfilippo, who owns the Cordova Inn and Station House in St. Petersburg and is the new co-owner of a building that houses Tampa’s Mise en Place restaurant. The tower project would sit on two parcels of land. One belongs to Loan Ranger while the application lists Ping Pong as owner of the other parcel, now home to a Fit2Run shoe store. But records show that parcel is owned by an affiliate of BayStar, which leases out the shoe store space and operates the adjacent Indigo Hotel. 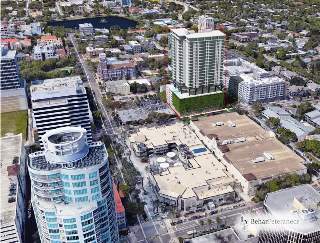 A 25-story mixed-use tower with 100 residences, upper right, is planned near the Sundial entertainment and shopping complex in downtown St. Petersburg. Attorney R. Donald Mastry, agent for the project, said he was unaware at the time of application that Ping Pong Partners did not own the land. He said, however, that he thought it had an agreement to buy it from BayStar. On Monday afternoon, Gianfilippo said, "The story is incorrect and we need to discuss it with our attorneys before we have any further comment." He declined to elaborate. From the city’s perspective, the project is on hold. Since the owner of the Fit2Run property did not authorize "the applicant to submit the site plan application, the application has been deemed incomplete and cannot move forward at this time," Corey Malyszka, the city’s urban design and development coordinator, said in an email.